There's a bad moon rising over Westminster. Friday's latest government defeat on Brexit may have been by a lower margin than the earlier thrashings, but the convincing 58-vote majority against the EU Withdrawal Agreement, in the teeth of an all-out whipping operation, hardly suggests that one more heave will see it home. And the result looks set to trigger a political chain reaction. The UK is now set to leave the EU without a deal on 12 April, unless a new postponement is agreed - and an EU Council meeting has been summoned for 10 April to consider the next moves. With a long postponement of Brexit now possible, MPs and peers may have to vote to set in train elections to the European Parliament, providing another very divisive moment for the Conservatives in particular, but also for Labour. It will also raise the very real prospect of a general election, or a further referendum, and the latter would produce a serious split in both the government and the Labour Party. That could spill over into the business of Parliament, with the potential for dissident Conservative MPs going on strike and refusing to vote for government measures, not to mention all kinds of unpredictable factional voting. And with the prime minister having signalled her departure, albeit making contingent on getting her deal passed, a variety of parliamentary events will become auditions for the contenders for her job. Sajid Javid has Home Office questions on Monday, Foreign Secretary Jeremy Hunt is up on Tuesday and Andrea Leadsom has her weekly Business Questions outing on Thursday. Other parliamentary events, not least around Brexit, will provide plenty of opportunities for other contenders. As ever there are plenty of activity beyond the immediate crisis - here's my rundown of the week ahead. The Commons opens, at 14.30 BST, with Home Office questions, with Sajid Javid the first of the potential Conservative leaders on parade. Expect some questions on knife crime, with the prime minister's promised summit due to be held in Downing Street in the morning, and an all-party group meeting with the Health Secretary Matt Hancock - another possible runner - in attendance in the afternoon. Then we're into day two of the "Letwin supremacy", the process under which a cross-party group led by the Conservative grandee Sir Oliver Letwin have mandated a series of "indicative votes" on alternative Brexit policies. 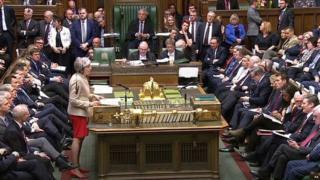 Using the previous sets of "indicative votes" on Brexit options as building blocks, the attempt will continue to assemble a package of policies which can command a Commons majority. There is a process under way, attempting to meld together the Ken Clarke customs union proposal with the Margaret Becket proposal that any withdrawal agreement must be put to a referendum. The fine details will be critical, so negotiations will probably continue over the weekend, perhaps with attempts to build momentum with stories appearing in the Sunday papers. Other compromises, new ideas and new iterations of old ideas will doubtless surface - but the final selection of options will again be for the Speaker. Watch out too for the detail of the Business of the House Motion, which sets out the framework for the debate. As in the previous Letwin debate, it may seek to allocate another day for more consideration of options that are further refined after this latest round of voting. It might be Wednesday 3 April. If that's not enough Brexit, in Westminster Hall MPs debate a series of e-petitions on the issue starting with e-petition 241584, while calls on the government to revoke Article 50 and remain in the EU. This had attracted a record 5,963,374 signatures at the time of writing. Alongside that, MPs will also debate e-petition 235138 calling for another referendum, which currently has 144,599 signatures, and e-petition 243319 which urges MPs to honour the result of the 2016 referendum, which has 159,503 signatories. My committee pick is the Public Accounts session, at 16.00 BST, on cyber security in the UK, with the Cabinet Secretary, Sir Mark Sedwill, and the UK National Security Advisor, Madeleine Alessandri. The session follows a National Audit Office report, which found that the £1.3bn National Cyber Security Programme was established with inadequate baselines for allocating resources, deciding on priorities or measuring progress effectively. In the Lords, questions to ministers include Labour's Lord Faulkner of Worcester asking about the link between anti-establishment politics and vaccine hesitancy. The main debates are on a series of select committee reports, including two on Brexit and one on Yemen. Business in the Commons opens at 11.30 BST with Foreign Office questions - starring prime ministerial contender Jeremy Hunt. The day's Ten Minute Rule Bill from the Conservative, Helen Grant, aims to require the Bank of England to meet standards for the representation of Black, Asian and Minority Ethnic people on UK banknotes. It supports the Banknotes of Colour Campaign which seeks to designate a BAME person as the face on the new £50 note. This is backed by a cross-party letter to the Governor of the Bank of England signed by nearly 90 parliamentarians. Then comes a relative rarity, a privilege motion to censure Dominic Cummings, the mastermind of the Leave referendum campaign, for refusing to give evidence to the Culture Media and Sport Select Committee inquiry into fake news. This will be a 90-minute debate on a motion delivering a parliamentary slap on the wrist - MPs have no operational power to deliver any other punishment - and also encourage the Privileges Committee and maybe the Liaison Committee (the umbrella body for select committees) to look again at sorting out Parliament's power to compel the attendance of witnesses. Labour's Kate Green, the new chair of the privileges committee, is thought to be more open to pursuing this than her predecessor. MPs then deal with Lords amendments to the Mental Capacity Bill. There have been important changes to the bill, in the Lords, including a new statutory definition of deprivation of liberty, and the disagreement between the Commons and the Lords over some of the resulting issues has not yet been resolved. Then MPs will vote on a Statutory Instrument relating to the draft Geo-Blocking Regulation (Revocation) (EU Exit) Regulations 2019 - which deals with traders discriminating against customers on the basis of nationality or location by, for example, automatically re-directing customers to country-specific versions of their website with different terms and conditions. In Westminster Hall the subjects for debate include Further Education funding. The Conservative MP Richard Graham wants to press for an above-inflation budget increase to ensure good staff are hired, unused space is used, key workplace skills learnt, quality apprentices hired and trained, and business productivity improved. He and Labour's Nic Dakin argue that FE has been the Cinderella of education spending - government policy has protected the incomes of schools and universities, while colleges have seen an average funding cut of 30%. Other debates include one on youth inmates in solitary confinement, at 14.30 BST, and treatments for pancreatic cancer at 16.00 BST. Finally, the Conservative Nigel Huddleston, leads a debate on puppy smuggling to point out that since his last debate on puppy smuggling in November 2017, the number of puppies entering Great Britain illegally has continued to rise. The Dogs Trust's most recent investigation found that not only is the trade continuing to flourish within the EU but, worryingly, is now emerging in third countries too. His aim is to raise awareness with the public about puppy smuggling and encourage the government to reassess whether it is doing enough. Although much depends on the outcome of the Brexit negotiations, he wants more checks at ports, mandatory visual checks at the border and tougher penalties for those involved in the trade. On the committee corridor, the Environmental Audit Committee concludes its inquiry into Planetary Health, with evidence from, among others, the government's Chief Scientific Advisor, Sir Patrick Vallance. In the Lords, peers end their consideration of "Finn's Law", the Animal Welfare Service Animals Bill, which provides for tougher sentences for attacks on police dogs and horses, and other service animals, with what will probably be a rather short third reading debate. Next comes the Draft Greater Manchester Combined Authority (Functions and Amendment) Order 2019 - which gives the Mayor direct powers over bus franchising and smart ticketing. It also allows the Greater Manchester Combined Authority to fund improvements to bus services through the council tax. Then peers move on to a debate marking the 70th anniversary of NATO and pondering its continuing importance to UK defence and security. MPs begin, at 11.30 BST, with Welsh questions. Prime Minister's Question Time will follow as normal at noon - a piquant occasion, no doubt, with the PM now in the departure lounge. Then, Labour's Kerry McCarthy will present a Ten Minute Rule Bill on Animals (Recognition of Sentience) which will impose a duty on public bodies to have due regard to the welfare needs of animals as sentient beings when formulating or implementing policy. It will cover decapods and cephalopods - crustaceans, octopuses, squid - and create an Animal Welfare Advisory Committee to issue guidance on how the animal sentience principles should be interpreted and applied. The animal welfare minister told the EFRA Committee in March that the government was committed to legislating on sentience "as soon as possible" and was "looking for a vehicle" to bring it forward. She aims to provide that vehicle. There may then be a further takeover of the agenda by Sir Oliver Letwin and his cohorts (see above). If so, watch out for a Business of the House Motion seeking to take over a further day, perhaps in the following week. Otherwise, MPs will be invited to approve the Electronic Communications (Amendment Etc.) (EU Exit) Regulations 2019 and the Trade in Torture Etc. Goods (Amendment) (EU Exit) Regulations 2019. And then they will move to a general debate on the 50th Anniversary of the Continuous At Sea Nuclear Deterrent. In Westminster Hall, proceedings open with a debate on votes at 16, led by the Labour MP Jim McMahon, who saw a private members bill to give 16 year-olds the vote "talked out" in the Commons in November 2017. Other subjects include infant first aid training for parents, led by the recently resigned welfare minister, Sarah Newton (14:30 BST). She wants every new parent to receive training to spot serious illness in their child and take appropriate action. While child and adolescent health in the UK has improved dramatically over the past 30 years, in 2017 just under 3,000 babies died before their first birthday and 1,707 children and young people died between the ages of one and 19. The Royal College of Paediatrics and Child Health suggest that 21% of child deaths involved "modifiable factors" - something could possibly have been done to prevent death. Other debates include non-stun slaughter of animals (16:00) and veteran suicide (16.30). The latter is led by Labour MP Stephen Morgan, who says the government's efforts to support veterans' mental health are "substandard" with less than £10m per year (0.007%) of an NHS budget of over £150bn allocated to veteran-specific mental health services. The government is not only refusing to give the necessary money to veterans' services, but it is also refusing to give us the tools to highlight the gravity and reach of the problem by declining to hold relevant data, including recording suicides within the veteran community, as recommended by the defence select committee. My committee pick - inevitably - is the Exiting the European Union session, at 09.15 GMT, with Brexit Secretary Stephen Barclay. But the Justice Committee's look at how the Legal Aid, Sentencing and Punishment of Offenders Act 2012 is working out may put the Lord Chancellor and Secretary of State for Justice David Gauke on the spot about the state of the court system in general and about access to justice in particular. the draft Flags (Northern Ireland) (Amendment) (EU Exit) Regulations 2019 - which faces a regret motion from the Lib Dem Lord Bruce of Bennachie. The Commons opens, at 09.30 BST, with Brexit Questions, followed by the weekly Commons Business Statement from the Leader of the House, Andrea Leadsom. Then come two backbench motions. The first, led by the Conservative Ross Thompson, is on the introduction of the 2019 Loan Charge, which deals with HMRC's treatment of people facing huge bills for back taxes, sometimes amounting to hundreds of thousands of pounds. The charges are applied to people who had been encouraged to set up private limited companies by their tax advisers and, in many cases, their employers, but had been caught be a retrospective change in tax law. The second debate is on reducing restrictive intervention of children and young people led by the former Health Minister, Norman Lamb. The aim of this is to end the use of prone or face-down restraint in residential schools, children's homes, health units and assessment and treatment centres, particularly for vulnerable children with mental health conditions, a learning disability or autism, because it had been associated with several deaths and seemed to be dangerous. Mr Lamb believes the use of force is endemic in the system, and that children get injured as a result. His aim is to press the government to publish new guidance. In Westminster Hall , there are a number of select committee statements, firstly on the launch of the sub-committee on Disinformation, and then the Chair of the Foreign Affairs Committee, Tom Tugendhat, on their new report on China and the Rules-Based International System. In the Lords, at 11.00 BST, the usual half hour of questions to ministers will be followed by a series of debates on select committee reports - including the digitisation of the tax system, fair treatment for small businesses and the role of HMRC and advertising in a digital age and food prices and availability.